The temperatures during winter time are getting lower, so we tend to wear cozy and warm clothes to protect ourselves from the cold. Sweaters and cardigans become part of our everyday looks and also we wear accessories like scarves, hats and gloves. All of these accessories can be found in versatile styles and colors. Gloves can either be short or long, leather or knitted, plain or embellished. Scarves can differ from plain to oversized ones, one colored or with some eye-catching pattern. And when it comes to hats, you can choose between different styles of fedora hats and beanies. Today, we would like to show you 15 Trendy Ways Of How To Wear Beanies This Winter and we hope that you will like them. Beanies are comfortable and fashionable pieces. They can be found in different styles and colors. Their prices vary from really expensive made by great designer to cheap ones affordable for everyone. The beanies are really good for this time of the year because they will keep you warm. You can either choose a beanie that will match with with the rest of your outfit, or you can choose some contrasting and vibrant color and thus make your beanie pop out from the rest of your outfit. Beanies can be found in versatile patterns too. Some beanies can also have an embellishment, whether some rhinestones, studs, pom pom or a veil. You can wear them to complete your casual looks, but also they can be part of your more stylish looks. Once you have chosen the right beanie for you, now it is time to choose how you will wear your hair. If you have long hair, then you won’t find it tricky of how to wear it under the beanie. Wear it straight or make yourself some waves or curls. Also, you can consider doing some loose side braid and once you take off the beanie, you can untie it and comb your fingers through for natural looking waves. If you have bangs, then again you have many ways to choose from of how to style them. You should wear it a bit further back on your head if you have full bangs. Or you can also swipe your bangs to one side and thus let them peek out from the front of your beanie. 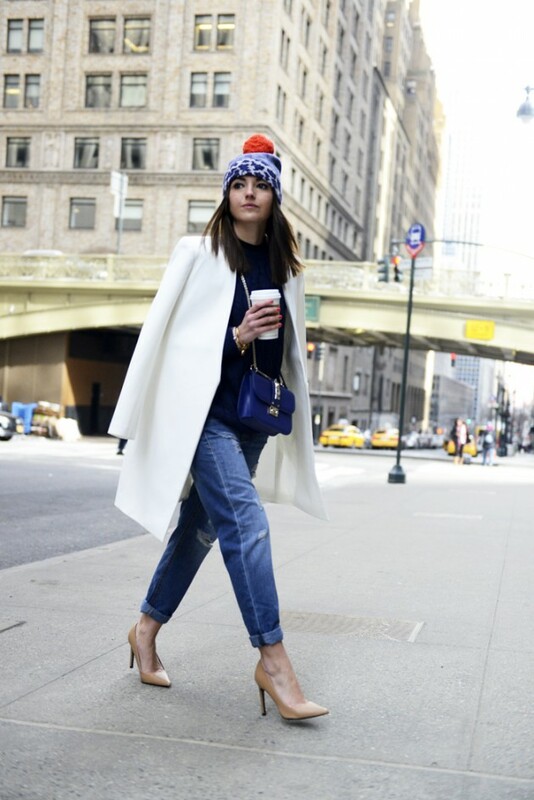 These were the 15 street style looks with beanies that we have chosen for you today and we hope that you liked them. Tell us in the comments which one from the above looks is your favorite and how would you choose to wear your favorite beanie this winter. And of course, stay up to date with us to find many other outfit ideas for your inspiration.